The original version of the story of the Star of Bethlehem, or the Christmas Star, is found in the second chapter of the Gospel according to Matthew. 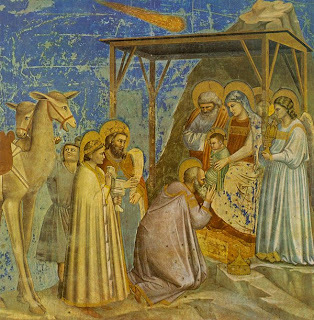 It describes a bright star that led wise men, or magi, from the east to find the infant Jesus. Over the centuries the Star of Bethlehem has become one of the most important symbols of the Christmas season. Our Nature Guide Jon Latimer tells us the story. "Experts today think that Jesus was born between 7 and 1 BC, with the spring of 4 BC as the most likely date. Astronomers are able to recreate the sky around the time of Jesus’s birth and have looked for a natural explanation for the Christmas Star. The three astronomical events most often proposed are a supernova, a comet or a conjunction of planets. "A supernova is an explosion of a star which suddenly becomes a bright object in the sky. They are rare, but one occurred in the constellation of Capricorn during March and April of 5 BC. This star suddenly appeared and glowed brightly for about 70 days before fading away. "Comets appear almost every year. An interesting candidate was recorded in 4 BC. It did not have a tail, which made it look like a star. However, the wise men of the time would probably have recognized it as a comet. And comets were usually considered omens of bad things to come rather than signs of good fortune. "A conjunction occurs when two or more planets seen from Earth appear to approach one another. In June of 2 BC Venus and Jupiter appeared to be so close together that they merged into a single, very bright star in the constellation of Leo. In those days Leo was considered the ruling constellation. This impressive conjunction would have certainly been noticed by the wise men of the time and might have inspired them to follow it west. "Any of these astronomical objects could account for what Matthew described. But if you don’t find them convincing, then maybe the Christmas Star was the result of some other natural event . . . or maybe it was simply a Christmas miracle."